The Roebuck had two incarnations. 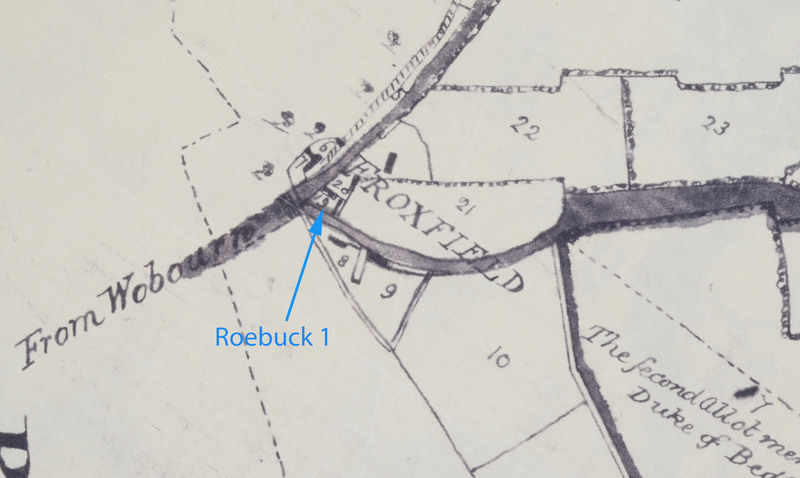 On the 1765 map and field book, plot B1 was a “Dwelling house, sign of the Roebuck; part of stable courtyard”. “Sign of”, while not explicit, is generally taken to mean it was a pub of some sort. 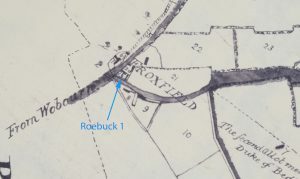 The map shows the two locations of the Roebuck, “Roebuck 1” marking the version from the 1765 map. Click for a larger view. Roebuck 1 is immediately opposite the entrance to the Duke’s park. According to this site, which is not connected with the Eversholt2 site in any way but does have some useful items, the Duke had the pub closed down about 1801. That site guesses that 10 and 11 Froxfield could be the location. The B1 reference in the 1765 field book suggests that the house currently known as 9 Froxfield was the spot. It would make sense for the Roebuck to move down the road to the Roebuck 2 location marked on the map above, keeping its name in the hope of keeping its customers. 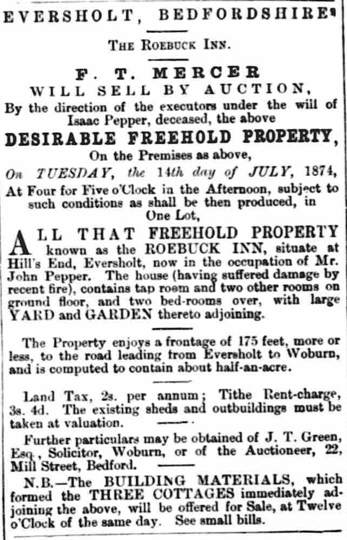 It’s not clear when the new Roebuck opened, but Isaac Pepper ran it later in the 1800s and “Isaac pepper’s beer shop” is mentioned in Hill’s End in December 1836 as the venue for the inquest into Sarah Deacon’s death. 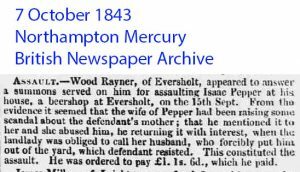 04 September 1847, Bucks Gazette reports that “new licenses were applied for … Isaac Pepper, Eversholt …”, so this might have been switching the Roebuck from a beer shop to a pub. Slater’s 1852 directory says that Isaac Pepper ran a pub called the Deer. ??? George Pepper (!) Green Rayner 31 Mar 1877 “until next licensing day”. What happened to John Pepper? It’s not clear that the pub was sold. 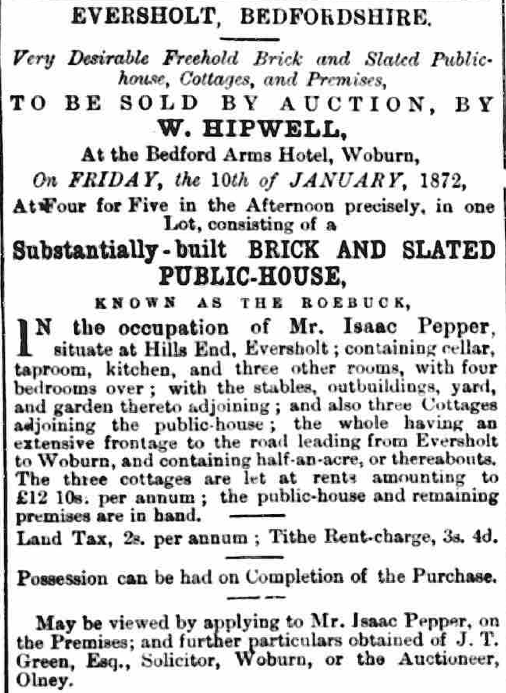 It’s interesting that Isaac seems to have owned the Roebuck, quite a big house, plus three cottages at the back, yet had effects worth less than £100. I haven’t paid the £10 for a copy of the will. Any offers? The Roebuck had recently been damaged by fire, which had destroyed the 3 cottages behind it. I hunted for reports of this in the press, but found none. The executors the late Isaac Pepper, of the Roebuck Inn, Eversholt, had issued notices of transfer to Thomas Dawborn, but Dawborn now declining to accept, the license remains in the hands of the executors. 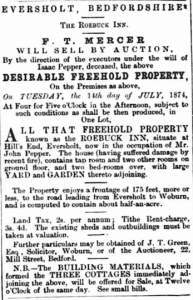 The 1847 directory says that Isaac Pepper ran a beer shop In Hills End. All the other directories up to 1869 say he ran the Roebuck, a pub. From 1876, the directories list George Pepper as the licensee. From 1885, Green Rayner. 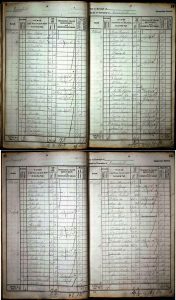 The 1894 directory is the last one to mention the Roebuck, so it must have closed by 1898. The Pepper family is large and well spread, so it’s worth sorting them out here. 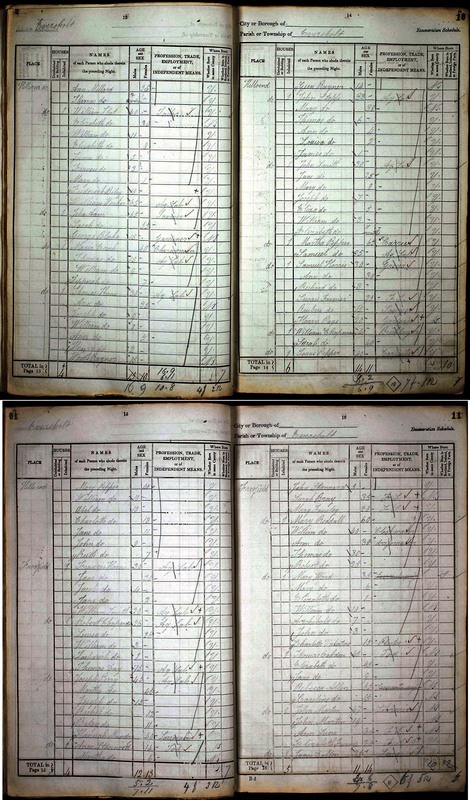 These census returns come from ancestry.com, who seem to allow image reuse. Click for full-size versions. 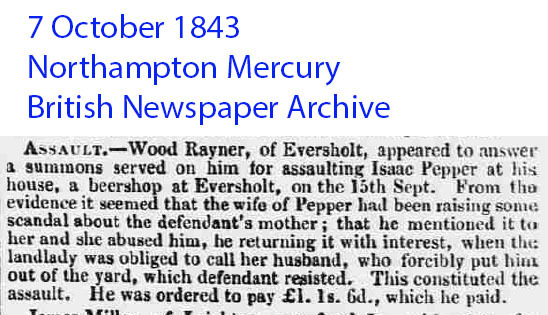 lsaac pepper, of Eversholt, was fined 55., and 6d. costs, for short measures. 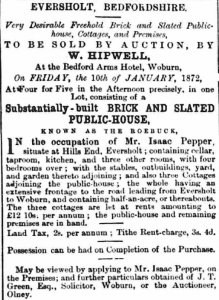 Interestingly, this court report from 1843 mentions Isaac Pepper’s beer shop – not a pub – but gives it no name. Maybe the name of The Deer or The Roebuck came later.